This mosaic of imagery from Curiosity's navigation camera system shows a scoop on the end of the rover's robotic arm taking a sample of Martian soil on Sol 66 (Oct. 12). NASA's Curiosity rover is rooting around what scientists call the Martian "Promised Land" — a place where three geological formations come together to provide a deliciously complex picture of Mars' ancient past. Although the ultimate destination for Curiosity's $2.5 billion, two-year mission is a 3-mile-high mountain called Aeolis Mons or Mount Sharp, the rover is going to be spending the next few weeks nosing around its current site, which is called Glenelg. That name comes from a geological formation in Canada's Northwest Territories, but it's also a fitting name because it's spelled the same forward and backward. Similarly, Curiosity will be going backward and forward, retracing its steps for a while when it's time to head for the mountain. Considering that Curiosity will be in the Promised Land for several weeks, we might as well get to know the place. 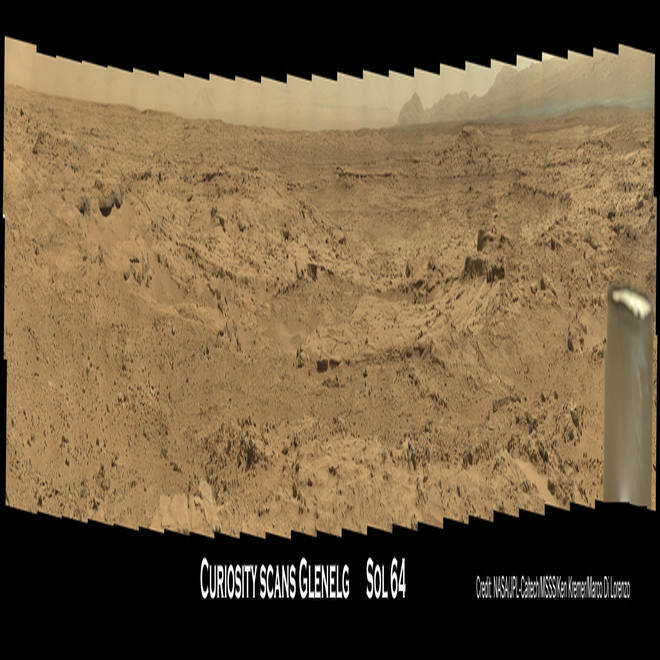 These pictures from Ken Kremer and Marco Di Lorenzo show you the rover's surroundings. Kremer is a New Jersey-based journalist, research chemist and photographer; Di Lorenzo is a physicist who's a high school educator and photographer in Italy. Both men are part of an active "amateur" community that makes use of the imagery provided by Curiosity and other Mars probes, such as NASA's Mars Reconnaissance Orbiter and Opportunity rover. "Amateur" is in quotes, because the work done by amateur image-processing gurus is such a great complement to the professional work from the Mars mission teams. Many of these gurus hang out online at UnmannedSpaceflight.com. Some also maintain their own Mars-related websites, such as Martian Vistas, the Gale Gazette and the Road to Endeavour. If you haven't checked out these sites yet ... well, what are you waiting for? And if you have other recommendations for interplanetary imagery, such as the Mars Science Laboratory mission's home page or the Planetary Society's blog network, feel free to pass them along as a comment below. A series of images captured by Curiosity's Mastcam system shows the foreground terrain on Sol 50 (Sept. 26), with eroded hills in the background. Click on the picture to see a larger image. 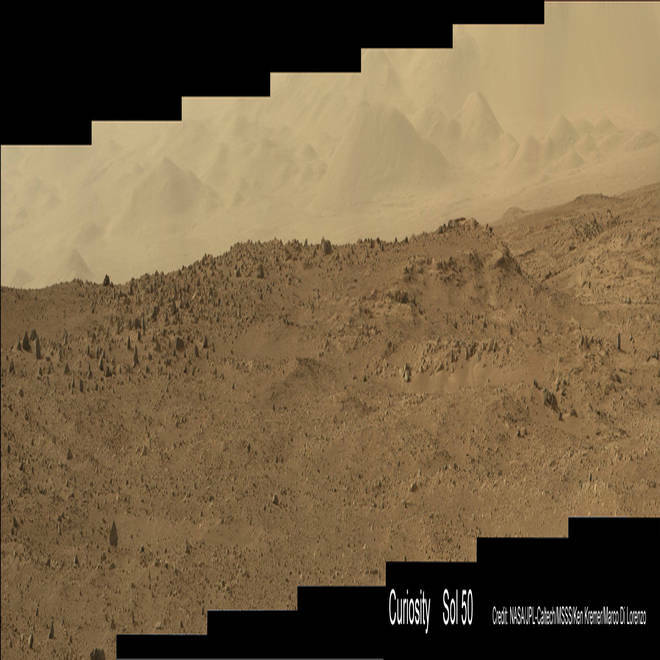 This panorama shows Curiosity's view of Glenelg on Sol 64 (Oct. 10), with hills in the far distance. The mosaic was assembled from 75 images acquired by the Mastcam 100 camera. Click on the picture to see a larger image. I used a section of one of the Kremer/Di Lorenzo panoramas as today's "Where in the Cosmos" puzzle picture on the Cosmic Log Facebook page, and it took only a matter of seconds for Bart Salatka (and many others) to name Glenelg as the place where the picture was taken. To reward his quick wits and fast fingers, I'm sending Salatka a pair of 3-D glasses that are being provided courtesy of Microsoft Research's WorldWide Telescope project. Two of the close runners-up, Josh Sandler and Manny Acevedo, are eligible to receive 3-D glasses as well. Those cardboard specs will come in handy for seeing 3-D pictures from Curiosity's mission, such as this fresh view of the Rocknest site at Glenelg.